One morning, just before I fully awoke, I heard that there would be an earthquake. It would not be the big one, but a smaller one. It would be a low 5. It wouldn’t cause a lot of damage. About a week later, I was walking by the tv. The thought came to change the channel and check the news. I turned on foxnews. Literally, a few seconds after turning Foxnews on, across the bottom of the screen, there was news of a 5.2 earthquake in California causing little damage. Something else stood out to me with this message, the mention of this earthquake not being the big one. This told me too that there is a big one coming. Here is a California news story on this earthquake. I was with people I knew. We had gathered together in an area. Food and supplies were short. The area we were in had no grass from us wearing it down. We had been there a little while. There was a cement shell of a tall building there. We were on the East Coast at the foothills of the Blue Ridge Mountains. We were on top of a large hill that was more like a small mountain. I remember one person trying to come into our group to get food or supplies. One member of our group argued with this stranger, trying to make him leave. I thought the situation was going to escalate. I thought the person in our group was about to use his hand gun. About that time, the ground shook very strongly. I wasn’t completely sure what was happening. Something had caused the ground to shake. I looked up to the woods behind us. I saw the animals running back into the woods up onto higher ground. They were in complete fear. I even saw a buck trying to climb up a square knotted net as it took a quick look to what was behind me. When I saw this, I turned around, now facing in the direction of the ocean. I saw a massive wave towering above the trees, up and down the coast as far as I could see. I turned back around and shouted for everyone to run. There was no time for anything else. We ran for our lives. We didn’t even have time to get very far. We had to get higher. I remember feeling the water come in and I was just able to keep my head above water. Then I felt the water go back down some. The dream quickly jumped back to just before the ground shaking. Again, the ground shook. This time I knew what was about to happen. I shouted to everyone that there’s a tsunami coming! I loudly told everyone that God had already shown me. I continued loudly urgently telling them God showed me to warn you! You have to run, get higher up! I looked back to see the water coming in and I saw a black tornado too(symbolic tornado). We ran and climbed high up into the cement building and the water didn’t reach the floor we were on. We had made it. After the tsunami, I saw in the sky, a large cloud like image, it was some sort of awful looking bug, like a beetle. Its body was shaped like a battle shield. We looked for somewhere safe to go. We traveled up the new coast line and found a large house and tried to cover all the cracks and tried to hide. There were so many of them. These bugs could kill you if they bit you. They were painful. They could go under your skin. Someone there was a nurse and was able to help, the people there who had been bitten, get the bugs out. God has used tornadoes in my dreams before varying in color, depending on the event. I knew this tornado was a way of confirming the event. God giving me the dream, twice together, is another way He confirmed the dream to me. I had a dream not long before Donald Trump was elected about things changing. I dreamed I was overlooking an intersection. The sun was on the horizon. I heard a voice I have never heard so clear. A truth that made me feel more alive than while awake. I realized it was the voice of Jesus. I was so in aw of hearing His voice that I almost got distracted by just hearing Him that I had to be refocused on what He was saying. He spoke out from the sky. He told me the Lord God loved me. He showed me Bill Clinton campaigning for Hillary Clinton saying she would be the next president of the United States of America. He then told me that these are mans words not the words of God. (He had chosen Donald Trump). He told me not to be afraid or worry, that the time is coming with things changing. Then He said to remember “It all ends with Me.”Then a second time He said, “It all ends with Me and an everlasting Kingdom.” Then a third time, but this time it was written in the sky with a line around the words like a stamp line to seal around the words “ENDS WITH ME”. This dream really sank in that the times we are living in are going to be different then those before us. I was reminded that God is in control of everything. He has got the whole world in His hands. In one dream I was standing in a place that wasn’t home. I was on a sidewalk by a lamp pole. There was a car pulled over on the side of the road. I was talking to the person in the back seat through the window. Then I was sitting in the back on the drivers side. I began telling the man on the other side of the seat about how much God loved him. I told him that I was sent there just to tell him this, that God loved him and wanted to save him. He had grown up and lived a different kind of life, not knowing my God like I did. He had heard of my God, the God of the Bible. Deep inside he had wondered about this God. He didn’t really like or think his own way of life was right, but it was all he had ever known. His way of life had a god, but of course it wasn’t like the God of the Bible with Jesus. He hadn’t dared to mention it to the other men he worked with or people around him in his life. He was so overwhelmed and happy to hear and see what God had done. God had actually sent someone directly to him just for him, to save him. God did care for him. God did love him. This man had his confirmation of my God being real, something he had thought and wondered secretly. I told him more about Jesus and taught him the Lord’s prayer and about salvation. He accepted Jesus Christ and his spirit was lifted with peace and joy. He was so glad and thankful. He felt so relieved. He was no longer going to do what he was on the way to do, which would affect his life and others. Although his life was still about to end, he accepted that and was okay with it. He was saved. I told him heaven would be wonderful and that Jesus would be the first person He sees. He would be there to greet him in heaven. I told him when I got to heaven I would look for him there. He said he would wait for me there. It came time for his life on Earth to end and it did. I knew he had gone to heaven. The dream fast forwarded like a VHS tape to the end of my life. It was my turn to go to heaven. I was walking in heaven with someone I had known on Earth, but I don’t know this person yet. We were walking in like a cafe area. I feel this may have been a representation of people I know in general. While walking, I looked over towards another area and saw the man I had talked to on Earth. I told the man I was walking with I had to go over and talk to this other person. He seemed puzzled. I explained how I had told him about Jesus while I was on Earth. He still didn’t understand why I needed to go talk to him. So, I just walked away and walked over to the man I had talked to on Earth. He stood waiting with Jesus. He was so happy and excited. He told me heaven was just like I had told him it would be. He said Jesus was there waiting for him just like I said He would be. The area around us was pure white. I could hear what seemed to be all of heaven rejoicing. I heard angels singing in joy. The joy was for this one man, a sinner who had accepted Jesus as his savior. I was so happy to see him there. The man told me, “I almost didn’t make it.” I remembered and realized just how close he had been to not making it. Then Jesus caused me to look over His left shoulder a distance behind Him. I saw a group of people what seemed to be mostly if not all men. They stood together, covered in a shadow. The shadow covered out to Jesus. I wondered about them. Jesus told me, “They don’t see Me in the light.” I felt like Jesus was showing me others who are like this man used to be, and could possibly be saved to. They had a somberlook to them. They didn’t see Jesus for who He truly is. I am really glad you emailed. All I can say is that I felt pulled/pushed to email Michael about all of this. Now, I believe, I see why. I didn’t completely understand why before. I felt like it was God’s hand directing me, so, I trusted in Him. I could see that Michael seemed interested in things going on and things that were to come. He was clearly staying on top of the major news topics today that, to me, seemed to have prophetic significance. I didn’t really know for sure where me emailing Michael these dreams was going to go. After all the things the Lord has walked me through, I’ve tried to really start to listen. This is me listening. I believe the Lord has been really starting to push me to tell people what He has shown me. I can be a procrastinator by nature, and so I tend to end up rushing around at the last minute. In one of the dreams given to me, I saw myself running around trying to get everyone to safety because the enemy was coming. War. So, here I am. I feel like we are close to the edge of everything about to unfold. I did not know you collected prophecies, nor that you had a website. I believe you are the reason I was pulled/pushed to email. Michael was the connection between you and me. God is so great. Here is a little brief background on me. I am a mother. I am 29 (turning 30 this year). 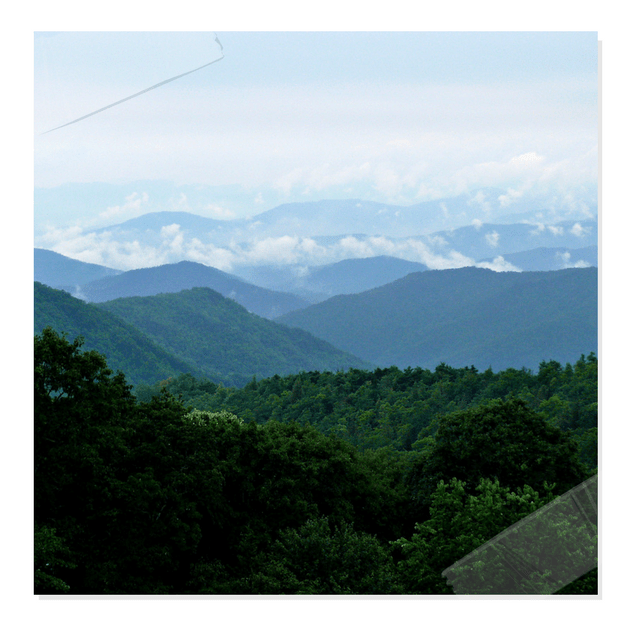 I have always lived in the mountains of Virginia. Two weeks before the twin towers were hit, I was given my first prophetic dream. I have been given numerous dreams since then. The number of major dreams really started to increase in 2013. Between 2013-2016 has been the main accumulation of things to come. Now, my last dream from the Lord was the one He told me, “The time is coming with things changing.” He knew I would naturally fear and worry because of the things He has shown me, but He told me not to fear or worry. He has told me before He would always be with me. So, in Him I place my trust and in Him is where I find my comfort. I will get on my computer today and pull up the dreams. I do not know if you are interested in all of the dreams, as some are of Jesus guiding me to follow Him. He literally told me the words, “Follow Me.” Not to make these dreams sound lesser. I see all dreams from the Lord as humbling, an honor, and to be taken seriously. You just requested the actual event dreams if I understand correctly. I will give you those. Are you interested in the rapture dreams as well or just the ones related to America specifically? Once I began to receive these dreams and messages, I began to try and keep up with the times we are living in. I use to almost never watch the news unless something really caught my attention. Looking back over the past few years, I am amazed and thankful at how I now look at the world. I feel like my eyes have been opened. I have tried to keep the introduction brief, as with the Lord, there is always so much more. Please feel free to ask questions as you have them. I want to give you an outline of the things I was shown. Let me know which ones you want. This is a list of non too personal dreams. Over the years I have been given dreams and visions about many things in my own life. From these dreams and the two NY dreams, I learned to recognize the dreams from the Lord. I also learned that if He showed it would happen, it would come to pass. These all have yet to happen. In 2013 a warring Angel showed me war to come. Then a short time later, I saw the final battle of Jesus defeating the red dragon (which of course I knew was Satan). I’ve had two rapture dreams, and a third one that was prior to and related to the first rapture dream. I saw fireballs from the sky. In both rapture dreams, the Lord brought me back to something in the Bible. The first one, I learned something from His word. The second one, I was reminded of something in His word. I’ve been told of earthquakes. 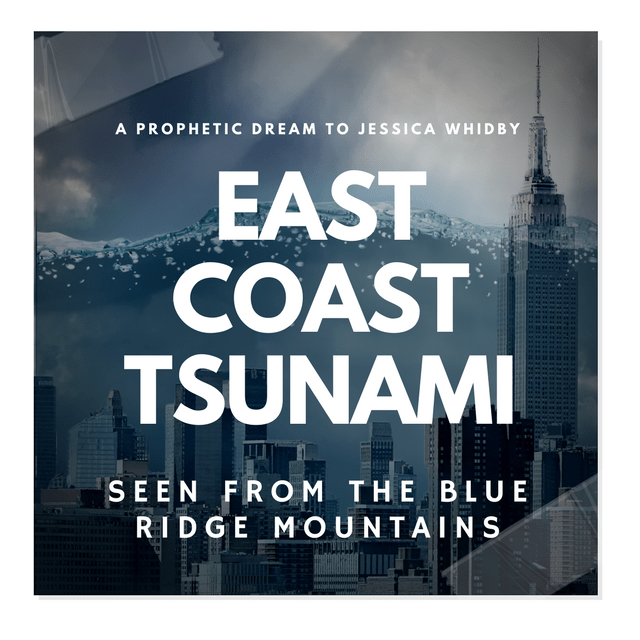 I’ve seen a tsunami so big that I was standing on the mountains of Shenandoah National Park in the Blue Ridge mountains and the wave reached us. I could see the wave from the mountains stretching along the coast way above the trees. I remember feeling the ground shake before the wave came in. I was shown that twice in the same night. The second time I was warning everyone. These dreams all have more details and there are more dreams, probably too much for an email. I wrote and saved many of my dreams on the computer as a way of helping me to remember when I had them. The first major event dream I had was about the Twin Tower attacks, two weeks prior. I’ve had enough dreams of things coming to pass in my life and bigger events, that I started writing them down and paying more attention. I think God used those events first so that I would know and believe that what He has shown me about what is coming is truly coming to pass in the near future. He really has my attention now, much more so than before. Someone close to me even has had two rapture dreams as well. He even had Jesus personalIy warn him to get ready, He is coming back soon. I certainly try to live better now. Jesus told me in one dream, “The time is short.” If you would like I can go and pull them up. I will put them as an attachment. Let me know and God bless. I think it is another sign of the times we are in, like rain clouds before the rain. I had a dream before Donald Trump was elected about things changing.